Victory to The Daily Telegraph’s pocket cartoonist at the British Press Awards. Via. The full list of nominees this year is here. Morning glory: Matt on April 1st 2009 in the Daily Telegraph. Bloghorn’s Alex Hughes reports from the UK Web and Mini Comix Thing which was held at Queen Mary’s University, Mile End, London last Saturday. This was my first experience of a comic convention (well, aside from a brief stroll through the Birmingham International Comics Show a few years back). I was more keen to attend this event because I didn’t think it was going to be at the superheroic end of the comics spectrum. Happily, I was right and it was a really refreshing experience. Aside from cartoon festivals such as Shrewsbury I’m not used to seeing such large crowds of people interested in humorous art. There was a wide spread of styles, genres and (if I’m honest about it) ability represented, from the slick to the amateur and this is probably what made the show interesting. It was nice to see short-run home-made UK comics rubbing shoulders with established American webcomic brands like Diesel Sweeties and Octopus Pie or British comic talent such as Sarah McIntyre, Woodrow Phoenix and James Turner (all formerly on the DFC). After a quick pint or two at the Post Thing Thing at the pub round the corner, (where I met Shug of Reet Comic) I went home exhausted and clutching a pile of comics that I spent too much money on (despite it all being reasonably priced). What with the recent closure of the DFC, could web and mini comics be the future for British comics? An exhibition of political and satirical cartoons goes on display at Bath Central Library from this Wednesday (April 1). Many of the 50 or so cartoons are rare and will not have been seen before. They include caricatures of Bath during its Georgian heyday by Thomas Rowlandson (creator of Bath Races, above, from 1810) images from Christopher Anstey’s 1766 New Bath Guide and modern cartoons which satirise some of the city’s current woes. The show, which runs until April 12, has been organised in partnership with the organisation Bath in Time and the Bath Comedy Festival. An exhibition of Posy Simmonds’ original artwork from the 1970s to the 1990s will be held at the new offices of Guardian News & Media, Kings Place, 90 York Way, London. It will run from this Friday (April 3) until June 4. The gallery is open daily from 10am – 6 pm and admission is free. Bloghorn spotted this great work during this week ending the 27th March 2009. 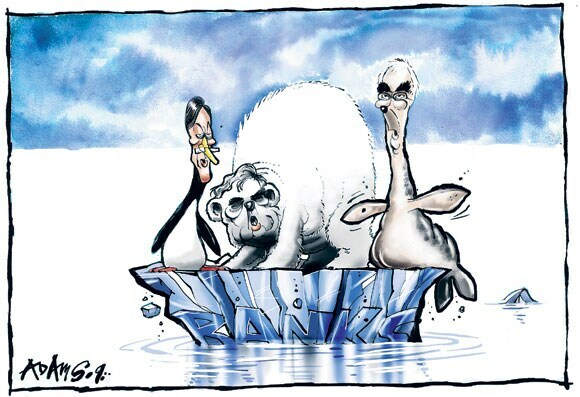 One: Peter Schrank in The Independent on faith. Two: Matthew Diffee in The New Yorker on marathon training season. Three: Riber Hansson in The Sydsvenskan on the all-American black hole. The final issue of the DFC is out today, though a group of artists and writers who were involved in the comic have launched a new blog dedicated to news, drawings, and new projects called Super Comics Adventure Squad. You can also read some of the strips that will not now appear in print on the downsized DFC website. Never take rejection to heart- somebody, somewhere will love your work. You’ll just have to find them. And practise, practise and continue to practise drawing. Your style will eventually reveal itself. Then practise some more. I fully intend to take my own advice one of these days. As for the future of cartooning in the digital age, it’s so bright, you gotta wear shades. See you there! Our thanks to Surreal, Bloghorn will have a new Cartoonist of the Month next Friday. In the meantime, scroll through our archives using the link at the top right of this page. Thinking of going to this year’s Shrewsbury International Cartoon Festival but not sure where everything is happening? Well, here at Bloghorn we’ve put together an handy interactive map of all the events, workshops and exhibitions to help you plan your visit. Click on any of the markers on the map to get a run-down of what’s happening there, or the link below to view a larger version of the map. A campaign has been launched to save the DFC, the weekly kids’ comic which is preparing to close on March 27, if a buyer cannot be found. A website called Save the DFC has been started by Barnaby Gunning, an architect who describes himself as a “parent of two DFC-loving kids”. He is trying to raise funds to stage a “subscriber buy-out” of the DFC and is asking people to pledge a sum of money to take part. The DFC was launched last May by the publisher Random House. Earlier this month, Random House said that “in the current economic climate, we have decided that the DFC is not commercially viable within our organisation”. Bloghorn spotted this great work during this week ending the 20th March 2009. Bloghorn asked the PCO Artist of the Month, The Surreal McCoy, how do you make your cartoons? Which other cartoonist’s work do you admire? An awful lot of Americans- Ben Katchor, Roz Chast, Edward Gorey, Dan Piraro, B. Kliban, Hilary Price. In fact any cartoon with a sense of the absurd or surreal.